During this series of Looking at the New Testament from a universalist’s perspective, I’ve found some verses that universalists do need to explain why they don’t mean what they at first glance seem to mean. (Usually that’s because of a poor translation.) But this is a verse that non-universalists have to explain away in order to hold their theory of eternal torment for nonbelievers. I urge, then, first of all, that petitions, prayers, intercession and thanksgiving be made for all people – for kings and all those in authority, that we may live peaceful and quiet lives in all godliness and holiness. This is good, and pleases God our Savior, who wants all people to be saved and to come to a knowledge of the truth. For there is one mediator between God and mankind, the man Christ Jesus, who gave himself as a ransom for all people. There are two important “all”s in this passage. First, it says that God our Savior wants all people to be saved and to come to a knowledge of the truth. Could that possibly be clearer? Now, the devotional that our church is using actually says that doesn’t mean that God wills all people to finally be saved. And the reason given is that if God wanted everyone to be saved then everyone would be saved! They cite Romans 9:19, which says that no one can resist God’s will. So they’re basically saying God doesn’t want everyone to be saved (despite what this passage says) because if that were true, universalism would be true! So they’re making my point for me, that if this verse means what it seems to mean – that God wants everyone to be saved – then universalism is true. 2)	God doesn’t really want all people to be saved. 3)	God wants all people to be saved, but the power of those people to rebel is greater than God’s power to win them over. So regretfully, not all will be saved. I think the interpretation that fits Scripture best is that God indeed wants all people to be saved and He indeed loves the world and everyone in it. And what God wills, God can bring about, even though it may take until the end of the ages for some to come to Him. But one day God will be all in all. If Jesus gave Himself to save all people, but all people are not saved – then was His sacrifice ineffective? This is the main reason Thomas Allin gives for believing universalism, and the reason he titled his book Christ Triumphant. You can read my review to get a taste of that reasoning – but do we really think God set out to save the world and then failed? Jesus gave himself as a ransom for all people, so if all people are not ransomed, then surely Jesus was defeated in each case of a person who was not saved. But back to the beginning. Do you believe in your heart that God truly wants all people everywhere to be saved? Isn’t that a bigger, a more powerful and more loving God than the one you hear about who (however regretfully) sends people to suffer eternally because they didn’t accept His offer and believe the right formula while they were still on earth? God loves you and He loves me and He loves our loved ones more than we do ourselves. And He also loves those people I didn’t really want or expect to see in heaven. All of them, even, maybe especially, those who seem truly lost now. And truly this brings glory to God our Savior. Once again, there are concerns about the way this is translated. The Greek word translated “everlasting” is the same Greek word eonian which means “of the ages,” and “everlasting” is a misleading translation. Those are pretty strong words! If you were punished with everlasting destruction and shut out from the presence of the Lord, where else would you be but in hell? Here again, the translation into English is misleading. As we have seen, the word translated as everlasting does not mean never-ending. It means the end is not known. The verse definitely talks of punishment, but it does not talk of punishment that never ends. The actual Greek text of this verse also does not say that those punished will be shut out from the presence of the Lord. It simply says that the punishment is from the presence of the Lord. Depending on the context, that phrase could mean punishment away from or punishment coming from the Lord. A few verses earlier, Paul says that God is just and will punish those who unjustly treated the Thessalonian Christians. He’s not talking about punishment that keeps people shut out from the presence of the Lord. He’s talking about just punishment that comes from the presence of the Lord on those who are mistreating His people. The destruction Paul refers to literally means ruin or desolation. In this passage, Paul is simply saying that those who are unjustly persecuting the Thessalonian believers will experience ruin from the hand of God in the age to come. He’s not talking about endless torment. He’s talking about how the wicked will be humbled before God, and the plans of their hearts will be brought to nothing, as God justly pays them back for the trouble they have caused His people. Again I’m reminded that the teaching that hell is never-ending torment was not part of the teaching of the church fathers as long as they were native Greek speakers. When Augustine, who did not speak Greek, came to be a leader of the church, he popularized the idea that hell is unending torment. I’m following along with my church’s reading of the New Testament and making comments when there’s a passage that might look different when read from the perspective of a universalist. Today we read Luke 16:19-31, the story of the rich man and Lazarus. I like the discussion of this story in George Sarris’s book, Heaven’s Doors, so I’m going to copy that out here. At first glance, it certainly looks like there’s no way around understanding this parable as promoting the idea of endless, conscious torment. After all, the rich man is in hell. He is “in torment and agony in this fire.” A great chasm has been fixed between the rich man and Lazarus. And those who want to cross over that chasm cannot. However, if we take a closer look at the passage, a few things bring that interpretation into question. First of all, the rich man was not in hell. As mentioned earlier, the English word hell automatically brings to mind never-ending punishment. But as we have just seen, the Greek word Jesus actually used here does not communicate that idea at all. Jesus said the rich man was in Hades, and Scripture specifically says that Hades, as a place of punishment, does not last forever. Hades will one day give up the dead who are in it and will itself be cast into the lake of fire. The next thing we should note is that this is a parable. Jesus is telling a fictional story to teach certain truths to His listeners. The audience for this parable was made up of two distinct groups of people. One group, the tax collectors and sinners, were spiritually poor and recognized their need for God. The other group, made up of the Pharisees and teachers of the law, were materially rich and had deceived themselves into thinking they were favored by God. Like the rich man in the parable, many of those religious leaders were actually clothed in purple and fine linen and lived in luxury every day. In this parable, Jesus alluded to an Egyptian folktale that both the religious leaders and the tax collectors were familiar with. But He told it with a very important twist. The story known to His listeners was about a poor scholar and a rich tax collector. After the two men died, one of the poor scholar’s colleagues had a dream. In his dream, he saw the fate of the two men in the next world. The poor scholar was in “gardens of paradisal beauty, watered by flowing streams.” But the rich tax collector was standing on the bank of a stream, trying to reach the water but unable to do so. In the original folktale, the Pharisees and teachers of the law would have identified with the poor scholar since they were also scholars who prided themselves on their knowledge of Moses and the prophets. They looked with marked disdain on the tax collector who they considered a great sinner simply by virtue of his occupation. In an absolutely brilliant move, Jesus turned the tables on the listeners and identified the religious leaders not with the hero in the story, but with the villain. They were the ones who were rich in this world’s goods, but poor in the eyes of God. Jesus wasn’t relating definitive facts about the afterlife. He was using the story to communicate specific truth about this life. The pride and hypocrisy of the religious leaders kept them from understanding what Moses and the prophets taught. The last thing to note about this passage is that the parable was told before Jesus had risen from the dead. A great chasm separated the rich man from Lazarus. But there is nothing in the account that says that the chasm will always be there. Neither Abraham, nor the rich man, nor Lazarus could do anything to make it possible to go from one side of the chasm to the other. That was the purpose of Jesus’ death and resurrection. God bridged the chasm through Him. Yesterday we looked at the first two parables in Luke 15 – the lost sheep and the lost coin. Today we’re going to look at the beautiful parable of the lost son, otherwise known as the prodigal son. But as many have pointed out, the son is not the prodigal in this parable – extravagantly generous. That’s the father. Before I talk about this passage and universalism, let’s think about this father. This is how much God loves you! Notice that the father did not force someone to pay back what the son had squandered before he forgave him. He didn’t require payment of any kind. He was watching the road for his son’s return. It was the son who needed to be reconciled to his father, not the other way around. But this is also how much God loves other people! Those sinners I’m eating with are going to be welcomed in heaven with great rejoicing! Those tax collectors and sinners who were gathering around Jesus – he was saying that his Father values them and would search for them until they were found. And then the parable of the Lost Son – this is how much the Father loves those sinners and tax collectors – He’s eagerly watching for them and will run toward them when He sees them approaching. Obviously, Jesus was thinking of the Pharisees when he told about the older son who didn’t want the father to celebrate after all his brother had done. But where’s the universalism in that? Well, suppose I’m right about the first two parables. Suppose they are saying that ALL will be saved, that the Good Shepherd will keep searching for every single lost sheep until they are found. Don’t argue with me for a second, just assume that universalism is true and examine how you would feel. Today is Transgender Visibility Day. If you’re convinced that being transgender is a sin (It is not – the reasons why not are a post for another day.) – will you be upset with God for welcoming them lavishly into heaven? Will you be upset if gays and lesbians and other queer people are in heaven? People who married someone of the same gender and people who were a different gender than the one on their birth announcement? Or how about cheating husbands? Murderers and *shudder* people of the opposite political party? If universalism is true – if our Father’s love is that big – will you be angry with God? Back to the older brother — Notice that he has no joy in the service he’s been doing for his father. He describes his work for his father as slaving for him. Notice also, though, the father’s answer: “You are always with me and everything I have is yours.” The elder brother didn’t have to nearly starve in the pigsty. I do believe there will be judgment, but that the Lord will win in the end. We can do it the easy way or the hard way. 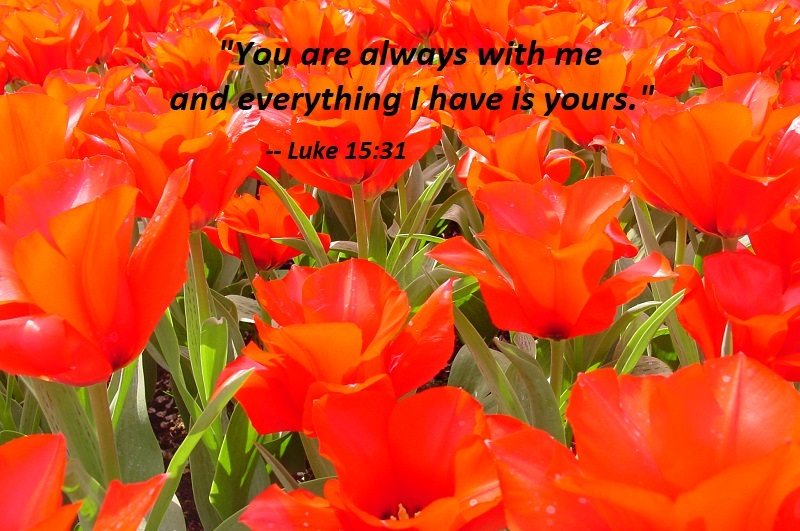 Those who choose to follow Jesus in this life have Him always with us and everything He has is ours. On the surface, the younger brother is the one doing things the hard way. And yet if the elder brother is finding no joy in being with the father, he’s got a drudgery of his own. And I suspect his pride is hurt by his little brother getting so much attention. But life with the Father isn’t about comparison. It’s not about being better than the others in our human family. May we never begrudge anyone the lavish love of the Father – He has more than enough for all of us. I’ve emphasized the until he finds it phrases above, because those are key words for universalists. These parables don’t leave any room for failure. The Lord is not willing that any should perish, and He will keep searching until He finds His lost sheep. This is yet another reason I say that there is no deadline. Yes, we saw in earlier passages that there will be judgment after death. But this judgment is spoken of as correction. Perhaps with some it is part of the process of finding that wandering sheep, of bringing it home. 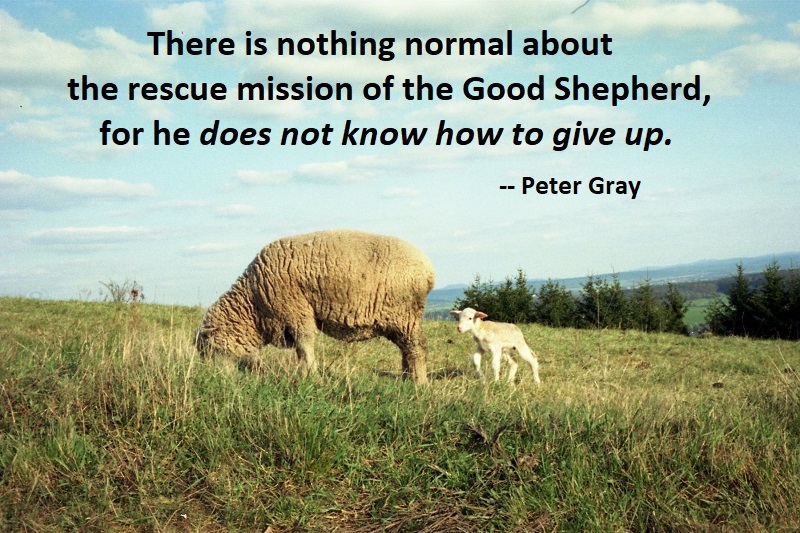 This Good Shepherd is not a shepherd who ever gives up. In fact, every time we sing Cory Asbury’s song “Reckless Love” in church, I think of those I know who haven’t yet come to Jesus. Because God’s love is indeed overwhelming, never-ending, and reckless. He will indeed not be stymied by our resistance. He will keep after us until we are found, even if it takes eons. Peter Gray wrote a booklet that he titled Until They Are Found, which I reviewed in 2010. It’s short, so I reread it before writing this post. He also asserts that this shows a shepherd who does not give up. He makes another point from these first two parables: Neither the sheep nor the coin contributes anything to being found. The coin was not found because the coin followed a law or a commandment. It was not found because it realized its own state of ‘lost-ness’ and began looking for its owner. It was not found because of some ‘good works’ it had managed to achieve. The coin was found only because the woman looked for it. What could a coin contribute to its being found? The answer, of course, is nothing. Absolutely nothing. And is this not the point of using a coin as the imagery? There is absolutely no possibility of being misinterpreted. A coin cannot contribute to being found in any way. A sheep could possibly have made a sound or even walked toward the shepherd. Even though Jesus does not say any of this happened, it is possible to misinterpret Him and think the sheep did something. The point I am attempting to make is that the religious people in Jesus’ audience, who were so convinced that they contributed to their salvation, could find a way to distort the obvious meaning of the story and conclude that the sheep did do something. And so the lost sheep story is followed by the story of a lost coin, and now there is no way to be misinterpreted. A coin cannot do anything to contribute to its being found. The coin was found because the woman went looking for it — no other reason can possibly be asserted. And what’s more, the woman went looking until she found her coin. Again, Jesus chooses to use this word until. ‘Until it is found’ carries no possibility of failure. It can mean only one thing: that all who are lost shall be found. The final story in Luke 15 is about the lost son — it shows how much the Father loves the one who is lost. We’ll read that one tomorrow. Now, I am a universalist — I believe that, eventually, all will be saved. But I also believe in hell. How is this possible? Well, I believe that hell is not unending. It is for correction, not outrageous, out-of-proportion punishment of unending torment for all time. Remember also that Jesus was speaking to religious people like the Pharisees who were very proud of their religion and believed they knew exactly what was necessary to please God. He was emphasizing to them that these Gentiles they despised would come from the east and west and north and south and enter into God’s presence before them. Yes, this is a passage universalists need to explain — but taken together with so many other passages, I still think that universalism fits best with what the New Testament teaches. I tell you, whoever publicly acknowledges me before others, the Son of Man will also acknowledge before the angels of God. But whoever disowns me before others will be disowned before the angels of God. And everyone who speaks a word against the Son of Man will be forgiven, but anyone who blasphemes against the Holy Spirit will not be forgiven. George MacDonald has an entire sermon about this verse in the book Unspoken Sermons, Series One, the chapter titled “It Shall Not Be Forgiven.” I can’t include the entire chapter here, but I want to include some long sections from it. First, he talks at length about what forgiveness actually is. When we’re talking about God’s forgiveness, it includes the remission, the sending away, of sins. A man will say: “I forgive, but I cannot forget. Let the fellow never come in my sight again.” To what does such a forgiveness reach? To the remission or sending away of the penalties which the wronged believes he can claim from the wrong-doer. But there is no sending away of the wrong itself from between them. Here, again, there is no sending away of the wrong from between them — no remission of the sin. This man is a little nearer the truth, inasmuch as a ground of sympathy, though only that of common sin, is recognized as between the offender and himself. Which comes nearest to the divine idea of forgiveness? Nearest, though with the gulf between, wherewith the heavens are higher than the earth? For the Divine creates the Human, has the creative power in excess of the Human. It is the Divine forgiveness that, originating itself, creates our forgiveness, and therefore can do so much more. It can take up all our wrongs, small and great, with their righteous attendance of griefs and sorrows, and carry them away from between our God and us. Before we approach a little nearer to this great sight, let us consider the human forgiveness in a more definite embodiment — as between a father and a son. For although God is so much more to us, and comes so much nearer to us than a father can be or come, yet the fatherhood is the last height of the human stair whence our understandings can see him afar off, and where our hearts can first know that he is nigh, even in them. There are various kinds and degrees of wrongdoing, which need varying kinds and degrees of forgiveness. An outburst of anger in a child, for instance, scarcely wants forgiveness. The wrong in it may be so small, that the parent has only to influence the child for self-restraint, and the rousing of the will against the wrong. The father will not feel that such a fault has built up any wall between him and his child. But suppose that he discovered in him a habit of sly cruelty towards his younger brothers, or the animals of the house, how differently would he feel! Could his forgiveness be the same as in the former case? Would not the different evil require a different form of forgiveness? I mean, would not the forgiveness have to take the form of that kind of punishment fittest for restraining, in the hope of finally rooting out, the wickedness? Could there be true love in any other kind of forgiveness than this? A passing-by of the offence might spring from a poor human kindness, but never from divine love. It would not be remission. Forgiveness can never be indifference. Forgiveness is love towards the unlovely. Let us look a little closer at the way a father might feel, and express his feelings. One child, the moment the fault was committed, the father would clasp to his bosom, knowing that very love in its own natural manifestation would destroy the fault in him, and that, the next moment, he would be weeping. The father’s hatred of the sin would burst forth in his pitiful tenderness towards the child who was so wretched as to have done the sin, and so destroy it. The fault of such a child would then cause no interruption of the interchange of sweet affections. The child is forgiven at once. But the treatment of another upon the same principle would be altogether different. If he had been guilty of baseness, meanness, selfishness, deceit, self-gratulation in the evil brought upon others, the father might say to himself: “I cannot forgive him. This is beyond forgiveness.” He might say so, and keep saying so, while all the time he was striving to let forgiveness find its way that it might lift him from the gulf into which he had fallen. His love might grow yet greater because of the wandering and loss of his son. For love is divine, and then most divine when it loves according to needs and not according to merits. But the forgiveness would be but in the process of making, as it were, or of drawing nigh to the sinner. Not till his opening heart received the divine flood of destroying affection, and his own affection burst forth to meet it and sweep the evil away, could it be said to be finished, to have arrived, could the son be said to be forgiven. He’s making a point that sometimes we can’t receive God’s forgiveness. And it’s because of us. But, looking upon forgiveness, then, as the perfecting of a work ever going on, as the contact of God’s heart and ours, in spite and in destruction of the intervening wrong, we may say that God’s love is ever in front of his forgiveness. God’s love is the prime mover, ever seeking to perfect his forgiveness, which latter needs the human condition for its consummation. The love is perfect, working out the forgiveness. God loves where he cannot yet forgive — where forgiveness in the full sense is as yet simply impossible, because no contact of hearts is possible, because that which lies between has not even begun to yield to the besom of his holy destruction. Then he talks about the two sins Jesus said will not be forgiven. But there are two sins, not of individual deed, but of spiritual condition, which cannot be forgiven; that is, as it seems to me, which cannot be excused, passed by, made little of by the tenderness even of God, inasmuch as they will allow no forgiveness to come into the soul, they will permit no good influence to go on working alongside of them; they shut God out altogether. Therefore the man guilty of these can never receive into himself the holy renewing saving influences of God’s forgiveness. God is outside of him in every sense, save that which springs from his creating relation to him, by which, thanks be to God, he yet keeps a hold of him, although against the will of the man who will not be forgiven. The one of these sins is against man; the other against God. The former is unforgivingness to our neighbor; the shutting of him out from our mercies, from our love — so from the universe, as far as we are a portion of it — the murdering therefore of our neighbor. It may be an infinitely less evil to murder a man than to refuse to forgive him. The former may be the act of a moment of passion: the latter is the heart’s choice. It is spiritual murder, the worst, to hate, to brood over the feeling that excludes, that, in our microcosm, kills the image, the idea of the hated. We listen to the voice of our own hurt pride or hurt affection (only the latter without the suggestion of the former, thinketh no evil) to the injury of the evil-doer. In as far as we can, we quench the relations of life between us; we close up the passages of possible return This is to shut out God, the Life, the One. For how are we to receive the forgiving presence while we shut out our brother from our portion of the universal forgiveness, the final restoration, thus refusing to let God be All in all? If God appeared to us, how could he say, “I forgive you,” while we remained unforgiving to our neighbor? Suppose it possible that he should say so, his forgiveness would be no good to us while we were uncured of our unforgivingness. It would not touch us. It would not come near us…. With our forgiveness to our neighbor, in flows the consciousness of God’s forgiveness to us; or even with the effort, we become capable of believing that God can forgive us. No man who will not forgive his neighbor, can believe that God is willing, yea, wanting to forgive him, can believe that the dove of God’s peace is hovering over a chaotic heart, fain to alight, but finding no rest for the sole of its foot. For God to say to such a man, “I cannot forgive you,” is love as well as necessity. If God said, “I forgive you,” to a man who hated his brother, and if (as is impossible) that voice of forgiveness should reach the man, what would it mean to him? How would the man interpret it? Would it not mean to him, “You may go on hating. I do not mind it. You have had great provocation, and are justified in your hate”? No doubt God takes what wrong there is, and what provocation there is, into the account; but the more provocation, the more excuse that can be urged for the hate, the more reason, if possible, that the hater should be delivered from the hell of his hate, that God’s child should be made the loving child that he meant him to be. But George MacDonald doesn’t think this is the final word. No one, however, supposes for a moment that a man who has once refused to forgive his brother, shall therefore be condemned to endless unforgiveness and unforgivingness. What is meant is, that while a man continues in such a mood, God cannot be with him as his friend; not that he will not be his friend, but the friendship being all on one side — that of God — must take forms such as the man will not be able to recognize as friendship. Forgiveness, as I have said, is not love merely, but love conveyed as love to the erring, so establishing peace towards God, and forgiveness towards our neighbor. To return to our immediate text: Is the refusal of forgiveness contained in it a condemnation to irrecoverable impenitence? Strange righteousness would be the decree, that because a man has done wrong — let us say has done wrong so often and so much that he is wrong — he shall for ever remain wrong! Do not tell me the condemnation is only negative — a leaving of the man to the consequences of his own will, or at most a withdrawing from him of the Spirit which he has despised. God will not take shelter behind such a jugglery of logic or metaphysics. He is neither schoolman nor theologian, but our Father in heaven. He knows that that in him would be the same unforgivingness for which he refuses to forgive man. The man who denies truth, who consciously resists duty, who says there is no truth, or that the truth he sees is not true, who says that which is good is of Satan, or that which is bad is of God, supposing him to know that it is good or is bad, denies the Spirit, shuts out the Spirit, and therefore cannot be forgiven. For without the Spirit no forgiveness can enter the man to cast out the satan. Without the Spirit to witness with his spirit, no man could know himself forgiven, even if God appeared to him and said so. The full forgiveness is, as I have said, when a man feels that God is forgiving him; and this cannot be while he opposes himself to the very essence of God’s will. But he does not believe this is a fixed, final condition. The Spirit of God is the Spirit whose influence is known by its witnessing with our spirit. But may there not be other powers and means of the Spirit preparatory to this its highest office with man? God who has made us can never be far from any man who draws the breath of life — nay, must be in him; not necessarily in his heart, as we say, but still in him. May not then one day some terrible convulsion from the center of his being, some fearful earthquake from the hidden gulfs of his nature, shake such a man so that through all the deafness of his death, the voice of the Spirit may be faintly heard, the still small voice that comes after the tempest and the earthquake? May there not be a fire that even such can feel? Who shall set bounds to the consuming of the fire of our God, and the purifying that dwells therein? It’s a difficult passage — even George MacDonald acknowledges that. And yet Jesus forgave his murderers while they were still in the act of crucifying him. It makes sense to me that if there are people God cannot forgive, the problem is with the people, not with the heart of God. They simply can’t experience God’s forgiveness. I think of my child, when he had done something he knew was wrong and I confronted him. I was ready to forgive — he was only a small child, and it was a small fault. But he wanted nothing to do with me! Or my ex-husband. I was ready to forgive. But again, he wanted nothing to do with me — He could not experience my forgiveness, and any overtures I tried to make were interpreted as unkindness. May we all open our hearts to the amazing forgiveness and love of our Father! As my church is reading through the New Testament together, I’m pointing out how you really can read it from the perspective of the belief that God is going to triumph and save everyone. It’s promised right in Colossians 1! The Son is the image of the invisible God, the firstborn over ALL creation. For in him ALL were created: in heaven and on earth, visible and invisible, whether thrones or powers or rulers or authorities; ALL have been created through him and for him. He is before ALL, and in him ALL hold together. And he is the head of the body, the church; he is the beginning and the firstborn from among the dead, so that in everything he might have the supremacy. For God was pleased to have all his fullness dwell in him, and through him to reconcile to himself ALL, whether on earth or in heaven, by making peace through his blood, shed on the cross. Again I ask, does “all” mean ALL? Imagine for a moment that it does! Some try to say that Philippians with “every knee shall bow” is talking about forced submission. Well, how do you explain away all being reconciled? How can reconciliation be forced? This isn’t talking about subjugation. I’m not saying there won’t be judgment. But the judgment is for correction — for the ultimate goal of reconciling ALL to Jesus. We were enemies in our minds. We were alienated from God, not God from us. When Paul suggests that every tongue shall confess that Jesus Christ is Lord, he chooses a verb that throughout the Septuagint is used to imply not only confession, but the offer of praise and thanksgiving as well; and as J. B. Lightfoot points out, the verb has such implications of praise “in the very passage of Isaiah [45:23] which St. Paul adapts . . .” Now a ruling monarch may indeed force a subject to bow against that subject’s will, may even force the subject to utter certain words; but praise and thanksgiving can come only from the heart, as the Apostle was no doubt clear-headed enough to discern. Quite apart from the matter of praise, moreover, either those who bow before Jesus Christ and declare openly that he is Lord do so sincerely and by their own choice or they do not. If they do this sincerely and by their own choice, then there can be but one reason: They too have been reconciled to God. If they do not do this sincerely and by their own choice, if they are forced to make obeisance against their will, then their actions are merely fraudulent and bring no glory to God; a Hitler may take pleasure in forcing his defeated enemies to make obeisance against their will, but a God who honors the truth could not possibly participate in such a fraud. There remains an even more important exegetical consideration. In Colossians 1:20, Paul himself identifies the kind of reconciliation he has in mind; he does so with the expression “making peace through the blood of his cross.” Similarly, in Philippians 2:6-11, Paul himself explains the nature of Christ’s exaltation; he does so by pointing to Christ’s humble obedience “to the point of death — even death on a cross.” Now just what is the power of the cross, according to Paul? Is it the power of a conquering hero to compel his enemies to obey him against their will? If that had been Paul’s doctrine, it would have been strange indeed. For God had no need of a crucifixion to compel obedience; he was quite capable of doing that all along. According to the New Testament as a whole, therefore, God sent his Son into the world, not as a conquering hero, but as a suffering servant; and the power that Jesus unleashed as he bled on the cross was precisely the power of self-giving love, the power to overcome evil by transforming the wills and renewing the minds of the evil ones themselves. And Paul not only endorses this idea; he also tells us exactly what he means by “reconciliation” in the two verses following Colossians 1:20, citing as an example his own readers: “And you who were once estranged and hostile in mind, doing evil deeds, he has now reconciled in his fleshly body through death, so as to present you holy and blameless and irreproachable before him” (1:21-22 — emphasis mine). So the blood of the cross does bring peace, but not the artificial kind that some tyrannical power might impose; it brings true peace, the kind that springs from within and requires reconciliation in the full redemptive sense. It seems to me without question, therefore, that Paul did envision a time when all persons will be reconciled to God in the full redemptive sense. Amen. And what glory to God if He actually is able to save everyone! Hallelujah! As my church reads through the New Testament, I thought I’d take the time to point out how some things sound different when you read them with Universalist eyes. I began this blog series after we’d already been reading for a quarter, so it doesn’t begin at the beginning. My motivation was that when I realized that George MacDonald believed everyone will eventually be saved — but also knew that George MacDonald loved and revered the Bible and knew the original languages — I didn’t understand how those things could both be true. So one of the first things I did was read the New Testament asking if it is even possible to interpret it as saying what George MacDonald said it did. It turns out, it’s not only possible, but as years went by, I’ve come to think it makes more sense and is a more natural reading of Scripture. But for this series, I’m just looking at what the New Testament says. — And it makes sense to conclude that this is talking about a future end of the ages when God triumphs and all are saved. Ummmm, No, it doesn’t say that. There’s nothing that says there’s a deadline after which if you confess Jesus is Lord, you won’t be saved. The Bible does say there will be judgment after death. But it does not, actually, say that judgment will last forever (at least not in the original Greek). And with God, punishment is always corrective. And I have and will say more about that in other sections of this series. For now, think about how glorious it will be if this verse says what it seems like it says — that the time will come when all, ALL — those in heaven and on earth and under the earth — will proclaim that Jesus is Lord and bow before Him. That our loving Father has brought everyone to Himself through Jesus. That would indeed be to the great glory of God the Father. I almost skipped a verse! This isn’t a verse I’d base all my theology on, but we do have an ALL verse in Ephesians 4, and taken together with other passages, it fits with Universalism. There is one body and one Spirit, just as you were called to one hope when you were called, one Lord, one faith, one baptism; one God and Father of all, who is over all and through all and in all. Now, I will even admit that Paul is talking about the church here, so he may just be saying that God is over all things about the church and through all things about the church and in all things about the church. After all, if God is the Father of ALL, He wouldn’t be tormenting His children for ever and ever in hell, would he? In fact, though there might be judgment after death, it would certainly be to correct and restore, wouldn’t it? You are currently browsing the archives for the A Universalist Looks at the New Testament category.